Part of the Palmer Community for Over 150 Years ! For a brief history of the United Church of Christ, the denomination to which we belong, please click here. Locally, one would be correct to assume that with this Second Congregational Church, there should also be a First Congregational Church. First Church called its first pastor on June 5, 1734, and the church building itself was located in what is now Thorndike. With the arrival of the railroad in Palmer, the center of commerce and population began to shift toward what is known as Depot Village, the section in which Second Church now resides. Fifty-four members of First Church withdrew from that congregation and formed Second Church, organized on April 1, 1847. A “meeting house” was dedicated on March 1, 1848. 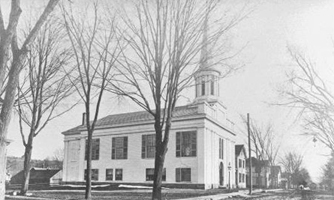 That building, which was a traditional white church with a steeple and clear windows on the sides (resembling many other Congregational Churches such as those in Monson, Belchertown, Ware and Brimfield), burned to the ground Feburary 1-2, 1909, was rebuilt in the current structure, and was dedicated on April 25, 1910. A longer, more detailed history of the church and its leadership, both lay and ordained, is available in the church office by request. Many are the people who have made it possible for this church to be the vibrant, engaged, and faithful congregation that it is. Our current members are part of that ever-flowing stream of Christian discipleship.